As some of our readers might know, my very first post on Mind Over Motor was about the upcoming diesel option on the new Volkswagen Passat. Well, it’s here. And, somewhere along the way, the Passat won Motor Trend‘s 2012 Car of the Year award, one of the most prestigious in the business. This was likely due in no small part to the new diesel model, among other things. But, I had to find out for myself just what else makes this new Passat “Car of the Year”. A local dealer had one ready for a drive, so I took the opportunity and drove it around to find out. The styling of the new Passat isn’t particuarly striking, but it’s very handsome nonetheless. Where the old model was a standout in more ways than one, the new one prefers to look upright and classy, with a chiseled three-box look. Next to the new Camry or the Accord that everyone wants, this new model looks professional, as if its designer wanted it to be parked outside the Manor in East Hanover, NJ, as opposed to a local diner. It’s clean, understated, and simply cool. Another potential plus is that unlike the previous one, this model is built in America (down in Chattanooga, Tennessee), which does give it appeal to some buyers who would normally simply dismiss it. The interior looks to be the same idea as the exterior, with no real surprises on the visual front, simply offering an effective, clean look with some upscale touches. One big change this year is that the new Passat is to be built as one type of car for the USA and China and a different version for the rest of the world–it’s a big gamble, but Volkswagen might indeed be on to something. In the flesh, the Passat is a great car inside and out. Three engines are available, including the well-known 2.5L inline-5, a 2.0L turbodiesel inline-4, and a 3.6L V6. The diesel and the base engine are available with manual or automatics, the V6 is automatic-only. Three trim levels are offered, in the form of the base S, midlevel SE, and flagship SEL. The interior offers excellent build quality and feels a cut above the new Camry and the American offerings as well, with beautiful soft-touch surfaces and supple trim. The quality is Audi-esque, and the amount of room inside is a huge surprise compared to the older one. The room in the back is reminiscent of the older A6, with scads of legroom for its size. Visibility is good, with no heinous blind spots. The seats are nice and big, showing that VW is clearly aiming this new model at the American market. All the gauges and dials have a distinctly German feel to them, and are clearly marked and easy to find. The navigation system in my test car featured plenty of nice touches as well. The dashboard is set up well, with no major drawbacks. The interior is like the exterior in that it is elegantly understated, logical, and surprisingly upscale. 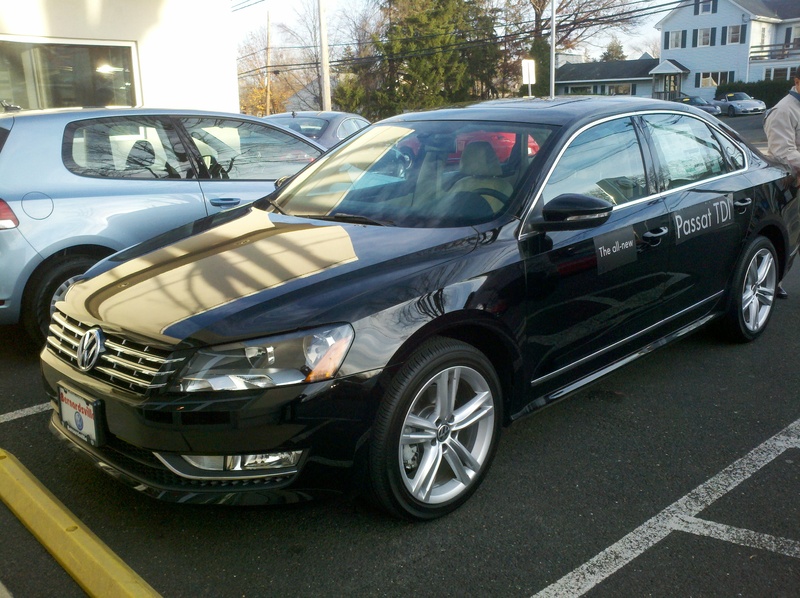 The test car in question was a new TDI SEL model, priced about $33K. On the road, the new TDI feels suspiciously impressive. It says little, with little engine noise and noticeably low tire thrum. Wind noise is about average for the class. The ride is comfortably soft, with only the absolute worst bumps registering into the cabin. Meanwhile, the steering feel is nice and heavy for the class, with a good amount of feel and feedback. The brake pedal, unfortunately, was slightly soft, but the brakes stop the big Passat without much drama or nosedive. The engine and transmission, though, make this car the class act that I wanted it to be. Volkswagen has been using turbodiesel engines in their lineup for quite some time now, and this new 2.0L unit is an excellent match for the Passat. It may only produce about 140hp, but it has an impressive 236 lbs-ft of torque delivered at just 1500-2500 rpm, so the TDI has a lot of low-end push for its size. It sounds excellent doing it too, with a throaty diesel note coming from the back end, but very little diesel clattering at idle when the engine is warm. The 6-speed DSG transmission makes the new model a willing dance partner as well, offering a well-behaved demeanor and little to zero hunting between gears. At the moment, this is the only non-premium sedan of its size to offer a diesel engine. All the other high-efficiency models in the midsize sedan market are hybrids, and the new Passat TDI offers an excellent alternative for similar money. Priced against the Ford Fusion Hybrid, it is better equipped and better looking, and against the new Camry, more upscale and better trimmed. 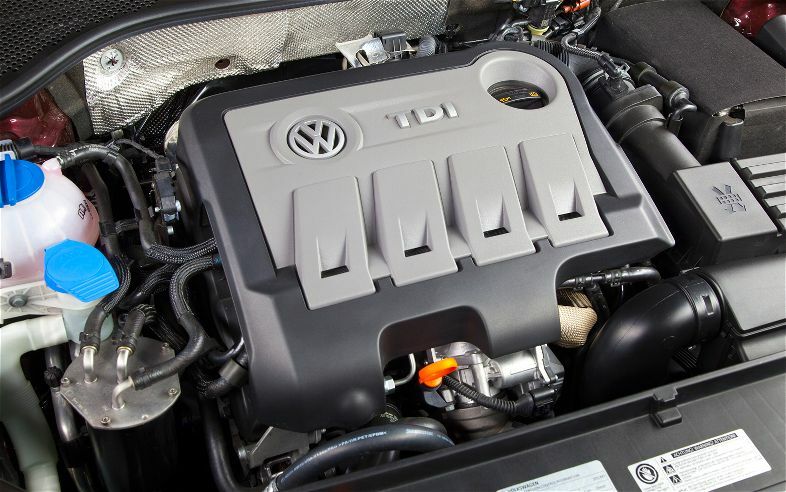 Volkswagen has announced that the inline-5 (the likely weakest engine on tap) is to be replaced with a new 1.8L I4 in the near future, and that a hybrid may be on the way to suppplement the TDI model (for those who still cannot fathom a diesel engine). 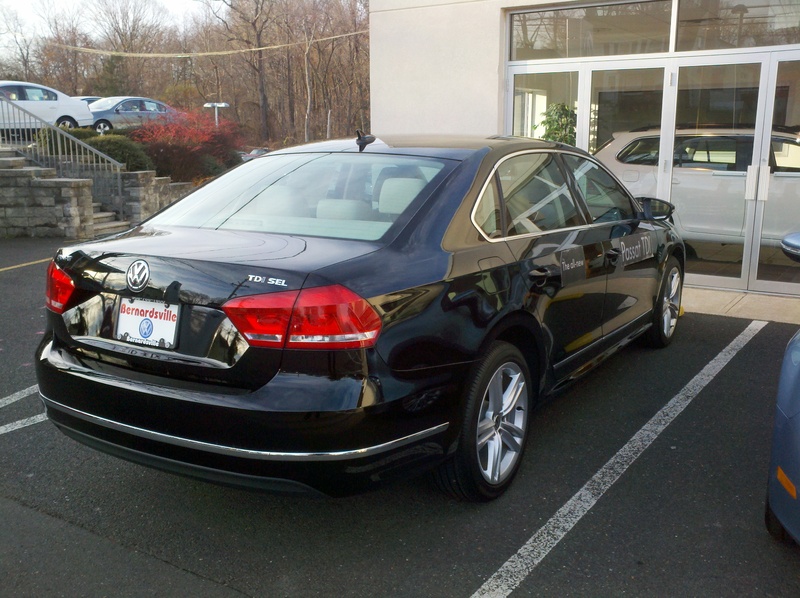 COnsidering this one’s benefits, though, makes the TDI Passat a great value. It offers decent on-road performance with plenty of low-end torque for around town and highway use, an excellent transmission, excellent interior, and EPA rated 30/40 city and highway mileage, an excellent figure. For 33 grand, this is a great value and shouldn’t be overlooked in the market. Get one now before the waiting list gets longer.